Get festive, but always drink responsibly! LCBOxflow wants to help with that. Photo by Tobias Wang. We are very much into the holiday season right now – and that means parties and gatherings of family and friends. This past weekend, my husband and I hosted our very first party in our new(ish) home, and it was such a great experience to bring our friends together, especially at this time of year. I’ll admit I was thinking a lot about all of the details. Everything from the music, to the food and drinks to even timing baking my classic chocolate chip sea salt cookies to right before everybody got there so that the whole house smelled delicious. It’s not about things being perfect – because trying to be perfect never works out, and is never really fun for anyone involved. I just want my family and friends to feel as welcome to my home as possible – not just during a party, but anytime……. Look what I can do! This magnificent looking creation only took about 10 minutes or so to assemble! The past almost six months since we moved into our new home have been - interesting. We’ve had a mini-flood, renovations that had to be re-done that had contractors here for weeks, plus a few other major homeowner hiccups. The result? Nothing felt finished or quite like home. We even held off buying major furniture items during the whole process - because where would we have put it with floors ripped up and things shuffled from one room to the next. But now, fortunately just as the holidays are approaching, things are starting to take shape. We do still have to paint, but we have a dining room table and several other things in place that make it truly feel like our home, and I am so incredibly thankful for that. We also have about double the space we used to have (hence the ability to now have a dining room table!) and the first thing that meant to me was that we could entertain a little more. My husband and I are both really social, and while we love going to visit friends and family, we always felt bad that we couldn’t really reciprocate due to lack of space at our old condo (essentially, our home office took up a lot of space where we could have hosted people). So now we are looking forward to making up for that and having friends and family over to celebrate. The lovely and talented Irene Matys, food stylist extraordinaire. If you’ve watched The Marilyn Denis Show of late, no doubt you are familiar with the super-talented Irene Matys, who unlike me, is in fact a food stylist of very consistent skill and ability, and always makes things look incredible. With that in mind, and my upcoming want to have family and friends over during the holidays, I was very happy to get the chance to learn from her and Stonewall Kitchen how to throw something together that is low risk, high reward while looking and tasting fabulous. I was invited, along with some other food-loving friends that I know, to gather to learn from Irene while sipping wine and eating all sorts of delicious things. Twist my arm - pretty much. Stonewall Kitchen really is a great partner for Irene for this, because their brand really has been all about bringing those extra special little touches to special occasions for so long now. They started out selling their preserves at a farmer’s market in New Hampshire back in 1991, and the business has grown now to the point where they produce 75, 000 jars lately at their current headquarters in Maine. Of course - the quality is all still there, which is why you find their products at better food stores (such as my favourite place ever, Cheese Boutique). Irene assembled a pretty incredible pantry for us to work with, and then talked us through how she would go about putting together a board with charcuterie, cheeses veggies, pickles and then all sorts of delicious preserves, chutneys, aiolis, crackers and more from Stonewall Kitchen and Tillen Farms. What I really took away the most from the process that she took us through is that Irene starts with what is seasonal first and lets that dictate how the board will look. For example, because it is the time of year for rich fruits like figs and pomegranates, plus savoury herbs like rosemary and thyme, those are the things that set the “mood” if you will for how the board would play out. The other thing I learned from Irene that was quite different than what I have done in the past is that she takes all her items and scatters them in about 3 or 4 sections throughout the board, instead of clumping all of one thing together in one place. Which makes total sense, because it avoids traffic jams if you just happen to have a bunch of people that all love, say, prosciutto or parmigiano (you see where my preferences are, obviously). Then, it was time to split into teams and get creating. I was partnered up with Liv Judd, who not only is known for her incredible style and attention to detail (lucky me), but approached this task with a laser focus that was enviable. 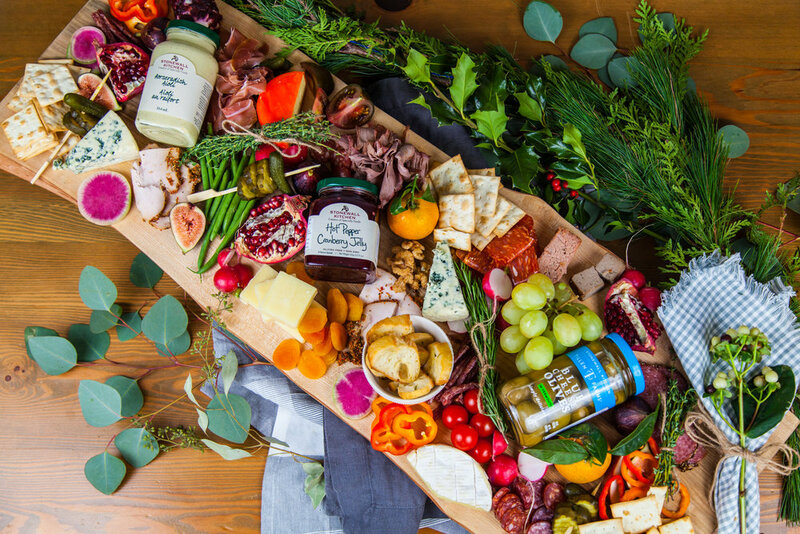 We had a huge pantry full of items to choose from, and were also working with a number of great products from Stonewall Kitchen including Tillen Farms Blue Cheese Stuffed Olives and Horseradish Aioli, Hot Pepper Cranberry Jelly and Sea Salt Crackers from Stonewall Kitchen . We actually put the whole thing together in 10 -15 minutes, and I am really impressed with the result. All the preserves and little extra touches from Stonewall Kitchen really helped to pull everything together. The final result from team Liv & Michelle! I’m pretty proud of this! Now that I have these few simple tips, and the experience, I feel way less intimidated about putting something similar together for my family and friends in the next few weeks. The best part about this is that with just a little bit of prep work (like slicing veggies ahead of time) you get to spend less time in the kitchen, more time with your guests, and everyone is happy and fed. All photos by Ksenja Hotić.